How Can a Rune Reading Help You? Like a Tarot reading, nothing is by chance. The runes that fall during the reading will be about the most pressing subject whether it’s on the forefront of your mind or in your subconscious. For example, someone came to me wondering about love but the runes talked about their career. This didn’t mean love wasn’t important in their life but rather the real issue that needed addressing was their career. Note: the only difference between a rune reading and a tarot reading is tool being used. For these kind of readings start by getting you to clear your mind. Next, I get you to pull 9 runes from a sack and focus on them. I will start to pick up information and we will discuss the general information. Then you will toss the runes on the table and rune reading will begin. The information from the runes will come from the shape formed by the scattered runes, which of the runes are showing, which ones are turned over and what runes lie next to each other. Additional runes may be pulled for clarity. Like numbers, letters also held a magical mystique about them. People could communicate by using these magical symbols which the ancients found fascinating much the same way we would feel in a foreign country where the tour guide can read the language of the land of which we are unfamiliar. The Runes are from the Norse-Celtic world and are based on a 24 letter alphabet called the Elder Futhark. Futhark comes from the first 6 letters of their alphabet: F-U-TH-A-R-K. The ‘th’ is one letter, thurisaz. This is much like how word alphabet is derived from Alpha and Beta, the first two letters of our letter system. The 24 letters are divided into 3 Ettas or groupings of 8 and each represents a different facet of life. Odin, the chief god of the Aesir, hung for 9 days from the world tree, Yggdrasill, in order to get the runes as well as their mysteries. 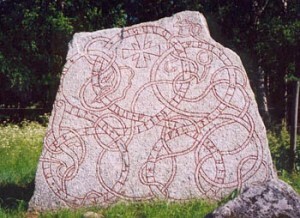 Each rune has a meaning as well as a sound and they can be read very much like a tarot card spread. For instance if the rune Fehu is drawn. This is the first rune and looks like an F. Its meaning is cattle = wealth. This basic meaning is material success or lack of it. It deals with physical wealth or one’s values system. Depending on which other runes come up with this rune in a reading then the meaning can shift.